If you’re looking for the best banks in Bangladesh to open a current account then we’re here to help you. You can open a current account in a commercial bank in Bangladesh where you can deposit and withdraw any amount of money at any time without giving any notice. Also, you can use it while making payments to creditors by using cheques. Moreover, it can be deposited in this account for collection Cheques received from customers. And you need depositing BDT5, 000 to BDT25, 000 while opening a current account. Those who have a current account, they are allowed to withdraw the amount with cheques, and they usually do not get any interest. But, you’ll not get any interest on the balance lying in current account with the bank in general. Why Best Banks in Bangladesh to Open Current Account? Those who generally have a higher number of regular transactions with the bank, current bank accounts are very popular among companies, firms, public enterprises, and businessmen. As the current account includes deposits, withdrawals, and contra transactions, it’s also called the Demand Deposit Account. This is why the best banks in Bangladesh are needed to open a current account. A current account is generally associated with huge transactions on a regular basis, being a zero-account. It’s already said that they don’t earn any interest because of the fluidity that these accounts offer. As it’s to carry out their transactions in seamless, quick, and transparent ways, a current account serves to be the first choice of business entities. Also, it’s very helpful for other entities such as freelancers while a zero interest current account continues to remain associated with organizations making many monetary transactions across the day. Apart from these, it’s very helpful for other entities as customers using their personal savings accounts for aiding business transactions. 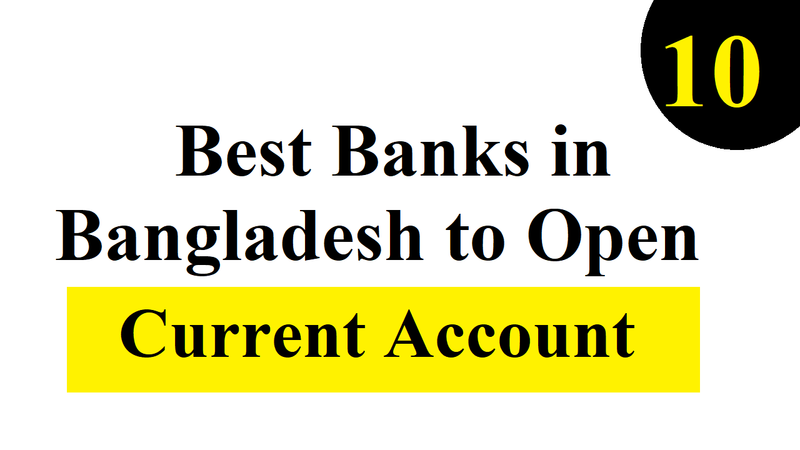 What are the Top 10 Best Banks in Bangladesh to Open Current Account? As the world of banking is changing fast, the demands of internet banking in the banking sector have become mandatory. When they need to pay bills, cell phone top-ups, or even transferring funds, the customer demands to get the facilities current bank account. Well, let’s see what the top 10 best banks in Bangladesh are to open a current account. Although BRAC Bank started its journey in 2001, it has proved themselves as one of the fastest growing banks in Bangladesh in just 17 years. With 448 SME Unit offices across the country, the bank has 176 Branches and over 500 ATMs. Apart from various services, the bank comes with the current account service for the interested clients. Also, the analysts believe that the bank’s profits may well top BDT5 billion ($60 million) for the year with another quarter to be reported. As traditional investment banking is virtually non-existent in Bangladesh In a thin market for corporate, Eastern Bank Limited has identified the multilateral finance sector as a rich seam, co-financing projects. While developing trade offices in Hong Kong and Myanmar and soon-to-open outlets in India and China, EBL claims to have built up Bangladesh’s largest offshore banking unit. Along with various services, it’s one of the best banks in Bangladesh that comes with the current account service for the interested clients. Standard Chartered bank is staying constantly the same as the things are getting changed more. In his first year in the chair at Bangladesh’s pre-eminent foreign bank, that might be the mantra at Standard Chartered Bangladesh. They are expanding their activities all over the world and this bank employs around 87,000 people in whole branches as it has more than 1,200 branches and more than 70 countries activities. This is because it’s one of the best banks in Bangladesh. François de Maricourt and his team at HSBC Bangladesh have positioned to help them on that journey as Bangladesh’s vast battalions of small and medium-sized businesses carry their country up the development scale from poverty to middle income. With buyers and suppliers both within Bangladesh and through the bank’s global trade network, HSBC helps connect SMEs. Also, it’s one of the best banks in Bangladesh that comes with the current account service for the interested clients. As a Public Limited Company on September 29, 1999, Mutual Trust Bank is another affiliate bank was incorporated. MTB is continuously working to offer new and improved services to serve their consumers better. They not only have introduced Mobile App for Smartphone devices but one of the best banks in Bangladesh that offers the current account. Not only the number one but most famous bank in Bangladesh is Islamic Bank Bangladesh Limited. For savings and interest, it maintains the rule of Islamic Shariah. Apart from many types of banking, home loans are one of their services that they offer. As one of the home provider, the bank was featured on most famous Bangladeshi Newspapers like Prothom Alo Daily Newspaper, Ittefaq, etc. As it comes with more than 60 branches, the bank fully follows the international stander finance and banking system. Apart from these, it achieves the ICAB National Awards in 2002. These all made is the best bank among many other local and international banks in Bangladesh. One of the popular private banks in Bangladesh is the Prime Bank, which comes with various banking services. Sonali Bank Limited is not only famous for provided SME banking, green banking, and financial retail banking but offers home loans as well. From Teknaf to Tetulia, it has a large network all over Bangladesh. Along with many other services, the bank comes with different types of home loans for their clients. Moreover, the Bank has 165 Branches 4417 APM both and Bangladesh’s first joint venture bank in its 21 years’ banking. These all made it number 2 among the Bangladeshi banks.